Born in 1969, Shawn Carter, also known as Jay-Z, is an American singer, songwriter and entrepreneur who’s sold over 100 million records and rose up against extraordinary odds to succeed in life. While quite possibly considered as one of the most famous and successful rappers of all time, his early life was dominated by a string of failures and unstable family life that led to a career of dealing drugs. Born in Brooklyn, New York, Carter grew up in the housing projects known as the Marcy Houses in the Bedford-Stuyvesant neighbourhood. After his father had abandoned the family, it was his mother that raised him and his three siblings. He became passionate about music early on, appearing on several early recordings of artists such as Jaz-O and Big Daddy Kane’s, Daddy’s Home. However, while wanting to pursue a record career, he realized that no label wanted to sign him, so he opted instead to selling CDs out of the trunk of his car. 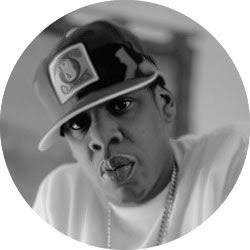 Every major label had turned him down, so he did what any enterprising young individual would do that was committed to succeeding — he co-founded his own label called Roc-A-Fella Records. Once the label had been setup, he sought out to find a distribution partner, which was no easy task. Ultimately, after finding one, Jay-Z released his debut album entitled, Reasonable Doubt, which reached number 23 on the Billboard 200, and it eventually hit platinum status, with Rolling Stones calling it one of the 500 greatest albums of all time. This was the start of a long and very successful career.